Close to mandatory retirement age, John and his wife Maxine felt that there still was room left for adventure in their lives. On a whim, and with no considered thought to the effects of their decision, they purchased a rundown olive grove and vineyard in Argentina, facing the Andean peaks. Travel was very much on their minds and this turned out to be their adventure, sometimes one too large to handle, let alone fail. They moved out to Argentina from their home in Spain, and soon learnt that the task ahead required a serious upgrade of the property. 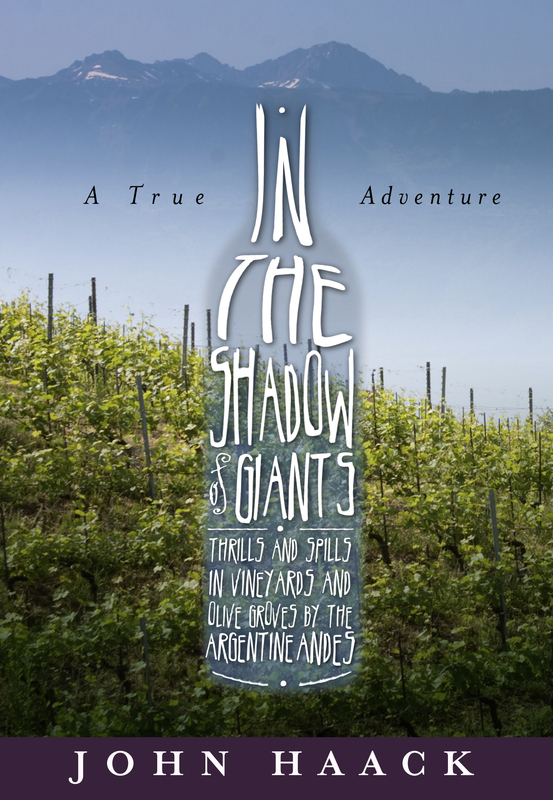 “In the Shadow of Giants” relates the experiences they lived through during the years that the adventure lasted. Here John describes the day to day events that coloured their lives, both on the property and on the travels and treks they made to the outer limits of the continent. Located in Mendoza, a western province neighbouring Chile, the farm was in the foothills of the Andes, looking directly up to the peak of the Aconcagua- the highest mountain in America- and on the edges of the desert of Cuyo. Here John and Max arrived one miserable, wintry day in August with their two dogs, ready to take up the challenge of transforming this rundown farm into a profitable Garden of Eden. All of this, despite their combined ignorance of the real matter at hand: they had no knowledge regarding Agriculture or farming. John takes us through the initial stages of settling in to the foreign, primitive society they had joined. We read about the personalities and beliefs of their newly discovered employees and suppliers as John and Max quickly realized they were forced to construct a home on the property with limited resources. Local lore placed the blame for poor weather on the three giant peaks of the Andes, which looked down on the town and punished or rewarded the populace via the weather conditions. If in good grace with the giant gods, the farmers were rewarded with placid conditions, boding well for the harvest. However, retaliation for sins unknown could be swift and fearsome. During their time in Mendoza they learned to overcome some arctic cold winters followed by long ultra hot summers. John relates the pleasures and agony of hot zonda wind, or storms bringing hail in the neighbourhood, generally days before the harvest. They also survived a couple of important earthquakes, which threatened all the housing and the vines. There is constantly an upbeat feel to the experience in John´s descriptions, not always agreeable, but always challenging and ultimately successful in all its facets. Employees became friends, and newly developed friends became, as they would claim, family. Appreciated and trusted. They considered themselves fortunate, as old friends and real family travelled across the globe to keep them company for a few days and enjoy the efforts as they developed. Not least was that they were able to find time to see the region. The book includes details of a backpacking trek through Ecuador, Peru and Bolivia, including tales of banditry, a run-in with police and visits to some of the oldest civilizations on the continent. We also read about an 8000 kilometer trip in their aging Isuzu van through the wonderland which are the lakes of the middle Andes and the glaciers of Perito Moreno to the end of the world, as Tierra del Fuego is known; and another across to the east of Argentina, along the wetlands of Corrientes to the fabulous Iguazu waterfalls. After eight years John and Max reached the conclusion that it was time to round off the adventure. The farm was thriving, and travel aspirations were largely completed, so all that was left was maintenance and repetition. They sold the property amid tears and promises to meet again, and are now back in their home in the south of Spain, with an open eye and a large antenna, searching for a new experience. You can purchase the book online from Smashwords in multiple eBook formats at http://www.smashwords.com/books/view/206397.